Just About Anything: After Canon in D, What Next? 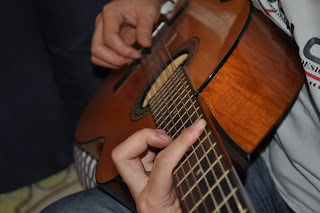 Did I tell you that my Hanhan loves to play the guitar? He is so passionate about playing it that he has tried his hands on playing Johann Pachelbel's Canon in D. Remember the Pantene commercial about two musicians, the violinist and the pianist? Well, that was the song that Hanhan has been practicing for months now and he has finally managed to get the notes, tabs and chords in his head. 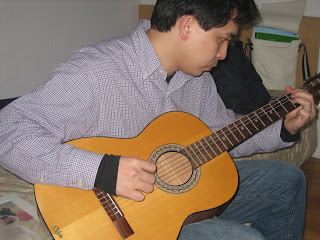 He is still practicing the song on a daily basis as his hands are not yet that quick and he has to create his own technique. After all, practice makes perfect. Now that he is done with Canon in D, he is working his fingers on Wind Song. This is a very famous tune of Japanese musician Kotaro Oshio. I wonder in which drama this song was used as the OST. Anyone have any idea? I am glad that Hanhan has found a renewed passion for playing the guitar... Soon, I will be mooning over his haranas (serenades)... Hihihi! More power to your hubby!